"Let these sanctuary mayors and cities absorb these illegals, and let’s see how they fare." - EGGS ACKLEY! Preach AWN, Reverend Jesse! 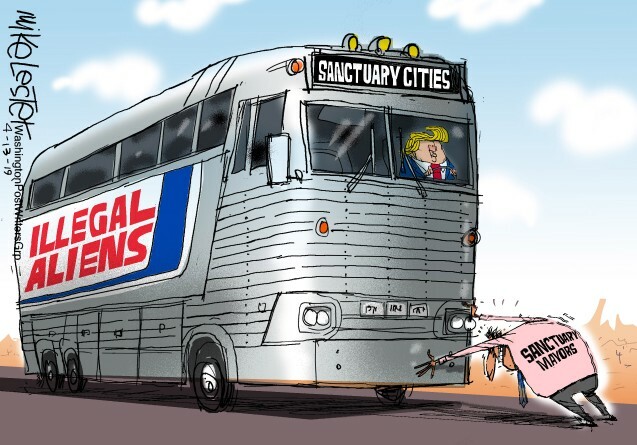 Fed up with Democrats refusal to help stop illegal aliens from flooding into the U.S. across the southern border, President Donald Trump said he is “giving very strong consideration” to a plan to bus detained illegal aliens to so-called sanctuary cities. Donald Trump said in a tweet that the radical left always seems to have an open-borders, open-arms policy, so his proposal should make them very happy. Trump also said that the Border Patrol is apprehending thousands of people every day, and because of current law they are only allowed to be held in custody for 20 days before being released into the U.S. Despite all the great things Schaaf said about illegals, she was evasive and dishonest about whether she would accept busloads of illegals in Oakland. Instead, the mayor responded by calling the president “racist.” The last refuge for liberal scoundrels is to name-call. The children of the lie don’t have truth on their side, so they will always resort to name-calling and lies to silence their critics. Liberals also knowingly conflate the issue of illegal immigration with legal immigration in order to confuse and deceive the public. Libby Schaaf is the same Democrat mayor who helped illegal aliens convicted of crimes to evade ICEand other law enforcement agencies as they tried to execute warrants on criminals in the city, endangering the lives of law-abiding citizens. In 2017, California passed a “sanctuary state” law limiting cooperation between local authorities and federal immigration officials. So, if sanctuary cities like Oakland are “safer” and better, why don’t Schaaf and other liberal mayors do as President Trump suggested and take in more of them? Let’s bring the illegal aliens to Oakland and other sanctuary cities and let Schaaf welcome them. The people who have to live with these non-English speaking, unskilled illegals are mostly black. They have to compete for the jobs, services, and their kids have to go to overcrowded schools and hospitals overrun by illegals. The schools in these Democrat-run sanctuary cities are already in terrible shape. The hospitals are awful. The infrastructure in these cities is already collapsing, and sanctuary city policies are only making things worse. Criminal violence is already out of control. Police are already undermanned an outgunned, and now they want to add thousands of illegal aliens – some of whom already have gang ties and are criminals. This is a bad situation. It’s also creating an even bigger war between blacks and Hispanics. It will further stress our law enforcement and city services – it’s a powder keg waiting to explode, but maybe this is what the left wants: to stress the system to the point where lawlessness and chaos consumes our cities. I wouldn’t put it past the children of the lie – they are wicked and they’ll do anything to usher in socialism. While Rahm has been welcoming illegals, thousands of black Americans are fleeing Chicago each yearbecause of the high cost of living and to escape the gang violence. Chicago’s black population is on track to shrink to 665,000 by 2030 – down from a peak of about 1.2 million, according to the Urban Institute. Hispanics immigrants (legal and illegal) are replacing blacks. According to a new report from the University of Illinois at Chicago titled “Corruption in Chicago and Illinois,” the Windy City ranked as the most corrupt big cities in the nation. Chicago recently elected Lori Lightfoot as mayor, another no-good liberal Democrat. This corruption was front and center in the way the city and state mishandled the Jussie Smollett racial hoax. Democrats Libby Schaaf and Rahm Emanuel welcome illegals as long as they don’t have to live next to them, their kids don’t have to school with them, and they don’t have to use the same hospitals and services. For Democrats, it’s all about buying future votes. Democrats in the New York State Assembly recently voted down a bill that would have allowed hundreds of thousands of dollars in college tuition aid to family members of Gold Star families after passing a measure earlier last week to give $27 million in the same benefits to illegal immigrants. What a shame! It’s time for these Democratic mayors to put up or shut up. Let these sanctuary mayors and cities absorb these illegals, and let’s see how they fare.